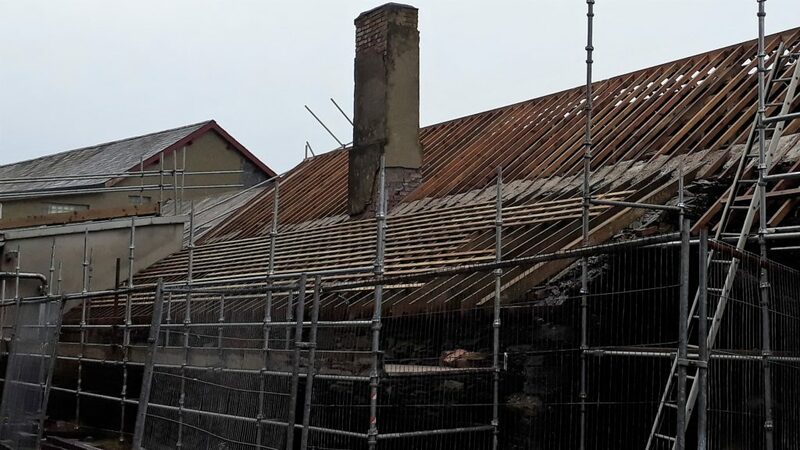 Talking to Derek Evans on Saturday about the Blacksmiths Shop – you learn something new everyday!The main roof timbers came from Huws Gray but we are talking about the back extension beams – a slightly different colour than the others. The timber for this section was sourced from Pantperthog Forest and treated at Llanaelhaearn, near Pwllheli, before being installed by our local builders. Chatting with the builder, the one remaining chimney will have to be taken down and rebuilt to make it safe, but it will be good to see the 5 chimneys back in place. The rest of the roof will be covered over until outside work can start again in the spring but work is expected to progress inside.